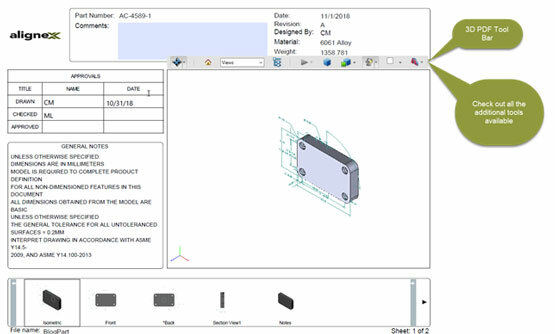 The intent for Model-Based Definition, or MBD, is to hold all Product Manufacturing Information, or PMI, within the model. Traditionally PMI has been held in a classic 2D drawing format. As technology has advanced, tools have been created (ex. SOLIDWORKS) that allow designers to share manufacturing, modeling or drawing information in a three-dimensional format. 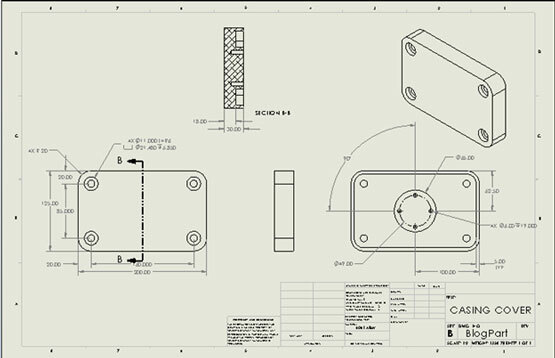 Before taking the first step towards 3D design, it is important to understand what exactly MBD is. Very commonly when MBD is discussed, the term “drawingless” is used. This leads to an overwhelming feeling of “How can we possibly just up and eliminate drawings? We would have to buy tons of hardware and software to view the model, train individuals on how to use the software and hardware and update our entire process." To be clear, “drawingless” is in reference to the classic 2D drawing like the image above. Almost all current MBD implementations can be considered “drawingless," but they are certainly not “documentless." A better way to think of MBD is as an upgrade to your PMI documentation (ex. the rotary dial phone to the cell phone). The most common document associated with MBD today is the 3D PDF. It contains all the things we would think of with classic drawing like views, notes and all the PMI data. The difference is the data is displayed in a much more user friendly manner. Also, all PMI information is created and held within the model and simply published out to the PDF. This makes the model the single source of true “Model-Based Definition." See below for an image of the model and captured views. Click here to download a fully functioning 3D Sample PDF. To inspect the model, double click each view to bring it into focus in the view window. The view currently active in the view port can be rotated as well as all additional 3D PDF functions. The ability to interactively interrogate a model quickly answers many of the questions the user may have. In addition, these documents can be printed and used in the same manner as a classic drawing. There are also many options available for the PDF layout. The goal of MBD is to store all manufacturing information in a single location, the model. Without MBD, PMI is created and stored in a separate drawing document requiring there to be two sources of truth when discrepancies are encountered. When a data mismatch is found which document wins? This is a common challenge with classic drawings. With MBD, all data is stored in and derived from the model providing a single source of truth when clarification is needed. MBD is “drawingless”, it is not “documentless.” Now that we know where we are going we can continue our journey. Thanks for reading! 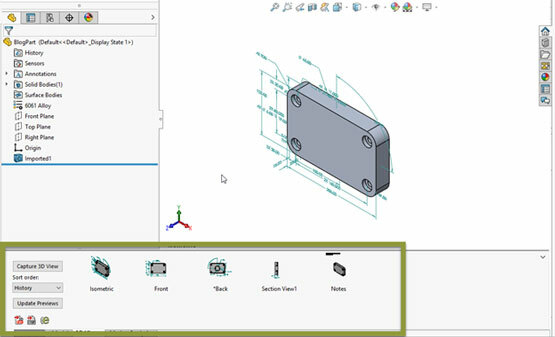 Watch out for future additions to the MBD blog series to learn more about how MBD can help improve your design processes today. For more information, check out our Model-Based Definition Video & Resource Library. Also, don't forget to subscribe to the Alignex blog to have future content like this delivered right to your inbox. 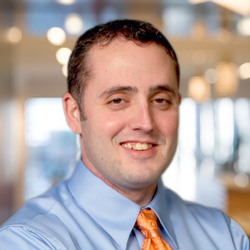 Cole McLeod is a Senior Application Engineer at Alignex, Inc. It’s rare for Cole to have a spare moment between teaching classes and tackling a diverse set of fast paced engineering challenges, but when he does, you’ll most likely find him on a track leading a race team crew.